Knee replacement recovery time will vary for each person, but here is a good guide as to what to expect. Most people make an excellent knee replacement surgery recovery and are up and about very quickly. Gone are the days when people were in hospital for two weeks after their surgery. Now it's up and about straight away and home in just a few days. Knee replacement recovery begins before your surgery. You will have a rehab programme to work on which you can actually start before your operation to get your muscles in the best shape possible which will really help. The people who make the best total knee replacement recovery are the ones who start the rehab process before their operation. 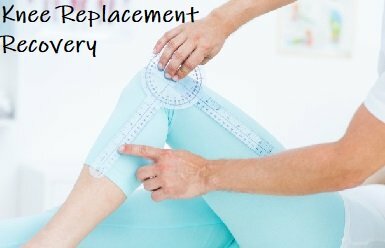 Here, we will look at total knee replacement recovery time, what is involved and how long it usually takes to get back to things. If are having or have had only one side of your knee replaced, visit the partial knee replacement recovery time section instead to found out how it will be for you. After total knee replacement surgery you will be able to get out of bed and fully weight bear on your new knee within 24 hours but you may need to use a frame, crutches or sticks for the first few days. You will start your exercises straight away and will progress through the rehab programme as instructed by a physiotherapist. Starting early really helps speed up knee replacement recovery time. Once you are discharged from hospital, you will continue your knee replacement recovery at home. Your knee will be sore and swollen after your knee replacement initially but often much less so than before the surgery as you will no longer be getting any arthritis pain. As the knee heals, the post-op knee replacement recovery pain will settle down, usually within a few weeks. You can help reduce the swelling by using Ice and Tubigrip (a special compression bandage). Wound Care: You must keep the wound clean and dry until the stitches are removed, usually after 7-10 days. Driving: You can drive after 4-6 weeks, as long as you can perform an emergency stop. Walking: You will be able to stop using any walking aids such as crutches or sticks as soon as you feel able – usually in a few days, and certainly by six weeks. After about a month you should notice quite a dramatic improvement in your knee. Knee replacement recovery time will be impacted by how well you comply with the recommended rehab programme. It is really important to be doing exercises to build up the strength and flexibility around your knee to gain the full benefit of the surgery (see the exercises for knee surgery section). You will need to continue with your knee replacement rehab programme for at least 3 months after knee replacement surgery, probably six months to get the best result from your operation. You will be able to progress your exercises as your knee gets stronger and more flexible. Visit the rehab section to find out more. The more you stick to your exercise programme, the quicker your knee replacement recovery is likely be. • You can resume many activities after 6-12 weeks, for example swimming. • Some activities are not advised following a total knee replacement as they put too much stress on the new knee joint. These include: jogging, contact sports (e.g. basketball and football), squash, badminton, jumping activities and skiing. If you are unsure, discuss things with your doctor. Pain and swelling can take up to 3 months to settle and knee replacement recovery time continues up to 2 years after your operation. 3) Can I kneel down with my knee replacement? Yes you can although it may be uncomfortable in which case use a cushion or knee pad. Kneeling won't cause any damage to the knee replacement. 4) How Do I Make the Best Recovery? In order to make the best knee replacement recovery, follow all the advice from your doctor and physical therapist. Start exercises prior to surgery, get up and about as soon as possible, stick to your rehab programme, take medications reguarly when advised and keep going. There may be ups and downs along the way, but stay focused and positive. You can find the answers to loads more similar questions in the total knee replacement recovery questions section.